Creative's new laptop audio range - ideal for gamers and movie buffs on the go... and those with MASSIVE houses! 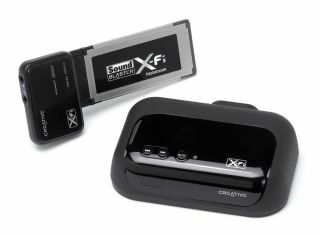 Creative's new Sound Blaster X-Fi Notebook Sound Card and Wireless Receiver promise to improve your listening pleasure from your lappy. The Creative X-Fi Notebook Sound Card promises users "a better sound experience on notebook PCs" and just fits nicely into a standard ExpressCard slot on their notebook, so no need to worry about opening up your lappy's innards! Creative also claims that its X-Fi Crystalizer technology "utilises audio algorithms to selectively restore the instrumental or vocal highs and lows that may gave been damaged or diminished during the MP3, iTunes or other compression processes." PC gamers (with their hefty Alienware or Voodoo lappies) will appreciate the X-Fi CMSS-3D tech which "provides a compelling surround sound experience for headphones, enabling gamers to hear the precise position of their opponents even when they cannot see them" as well as "Creative's EAX ADVANCED HD audio technology, for stunning positional audio realism in today's hottest games." For movie buffs, X-Fi Notebook's virtual surround sound will also appeal along with an additional free download of PowerDVD software with full DTS and Dolby Digital decoding support. Apple fans have been enjoying wireless iTunes pumped to their home Hi-Fi for some time with Airport Express, with Creative's new Wireless Receiver offering PC users the same service and "enjoy wireless audio without any drop outs. Individual zones can be created, to control sound around the home." Individual 'zones' can also be created around the home to control playback independently in specific rooms up to an impressive 100 feet away from your laptop (assuming you live in a mansion, that is!). Creative's new laptop Sound Card and Receiver will set you back £59.99 GBP. The sound card will be available later in September and the receiver in October.